I was going to post just JPGs but a few friends convinced me to post it with watermarks. Derp. I’ve been making a custom tall template and remaking RTP in it. 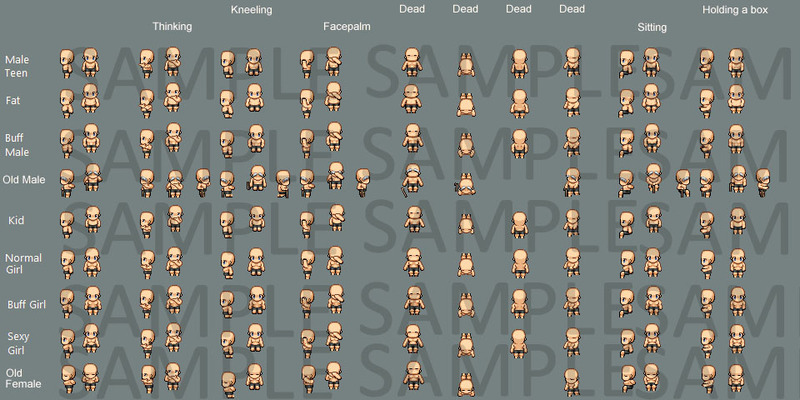 It includes both RMXP and VX/Ace characters and formatted too so it can have generator poses, even for the poses. These are not edits and recreated from scratch. While it has 7 unique frames, it can be cut down to 3 frames to fit the normal RTP. Fomar0153 has been kind enough to make a script for it just in case I’ll ever release it, just because he can. I guess the biggest question mostly is that, if I were to sell it, would you buy it and how much are you willing to pay for it? All the XP and VX RTP characters in a set like this? Would I buy? God yes. Well I’ve bought everything on RPG Maker Web, so I would probably buy this too, though I have no idea how much you should charge. I especially like the thinking and facepalm poses and I think a lot of people will want those. I’d probably buy it anyway, but I would buy it MORE if it had the single “pieces” (hairs, pants, clothes, shoes, eyes, capes, etc…) so I can mix-and-match them easily. I’d buy it even more if it included those pieces in an “easy to recolor” version (for example, various parts of a piece of clothing, separated in different layers, or different files). And sure, I’m planning to add more generator parts anyway! But if you have any references or suggestions for clothing pieces and hair, I’d really appreciate it. 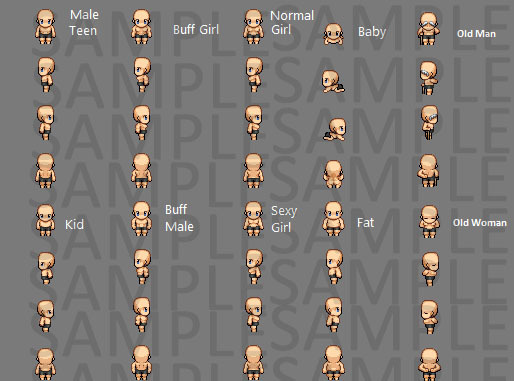 My idea was simply to include the “parts” of the characters you are already making and not only the “complete sprite”, but if you’re planning to include even more parts, it’s even better! Put a reasonable price. Remember, entire tilesets are sold cheap too. The worst thing you can do is overprice your product. no I won’t do diagonal movement, too much work for something that is not extremely necessary. will you be including the cover characters from vx and vxace or just rtp? I have the VX ones but VXAce is something I’ll have to think about. Just as a question. If you where to create these would we be able to use them in commercial games? If so would that only depend on if we have a purchased copy of the RMXP and VX and VXAce? Either way these would be totally worth it. If you buy them, you can totally use them for commercial games. And you can use them as long as you purchased an RPG Maker/IG Maker. Only because this style is sort of a derivative of RTP style and the character designs being from the RTP. You did make me think that I should make Non-RM someday though hahah. That’s cool. This would be a total must for me then. I’ve been looking around for a taller than RTP styled sprite and these would fit my purposes greatly. Thank you for all the effort though as you are a totally talented artist. I am not going to use this. That is even i design my own side view battler. AT least, I am not good at adobe photo shop and face. But I know that you are good at design. These are great, but I wouldn’t buy them. A big part of what makes spriting fun to me is making my own creations, posting the results, seeing what other people edit and make. But if these were purchase-only, they couldn’t be shared like that. You could certainly sell them, they’e good quality and you deserve to make money from them, but purchase-only sprites aren’t for me. Like, with those bases, i’d want to share the sprites i’d make on those bases, but I wouldn’t be able to, so i’ll keep making sprites I can also share. Would I be willing to pay for something like this? Certainly, though I’m a little curious how much you intend to charge (a lot of the official resource packs seem to run in the $10 to $20 range and if you’re talking about all of the VX Ace sprites, I’d gladly pay that range). I have to admit that I’m very excited to hear about this project. I’m fairly new to RPG Maker and while I really like VX Ace I just can’t get completely comfortable with the Chibi sprites. Any idea when it might be released? No point in selling it, because people would find ways to get their hands on them and re-upload them for others if that happened. Just because it’s the internet doesn’t mean I can’t find ways to somehow get sources for income to keep making the stuff I do and make free stuff for people at the same time. I have released bits and pieces of it in Member+ but I don’t know if I should release it in Sellfy store.